Michal Furmanczyk has spent most of his life fulfilling his dream as a professional acrobat, which enabled him to travel and live in cities all over the world. In 2011, he accepted an offer to work with the critically acclaimed acro-cabaret variety show, “Absinthe,” which led him to Las Vegas. Earlier this year, he planted roots in the Entertainment Capital of the World by purchasing a spacious one-bedroom residence in the sky at The Ogden, an iconic 21-story high-rise condominium tower in the heart of downtown Las Vegas. “I purchased a single-family home in 2013, but after a few years, I realized it was too much house for my needs and required too much maintenance,” Furmanczyk said. Many of Furmanczyk’s friends live in high-rise communities, so he explored almost all of them before falling in love with The Ogden and the unique vibrancy and culture found in downtown Las Vegas. His wife, Lupita, whom he met two years ago, works at The D Las Vegas, making The Ogden especially ideal for her commute — which is less than a 10-minute walk. “We received the keys to our home in August and since then have enjoyed exploring our new stomping grounds. We love the walkability and access to amazing restaurants and bars, including our favorite spot, Le Thai. My wife can walk to work, and because major freeways are minutes from here, I can be on the Strip and at work in no time,” Furmanczyk said. 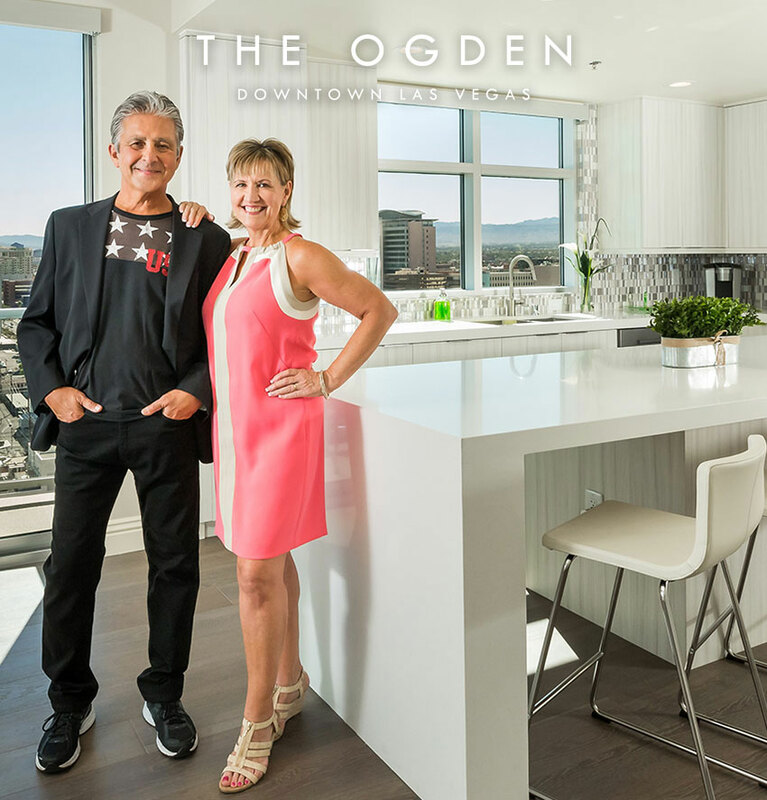 Other Ogden selling points for the couple include the upgraded kitchen where they love to cook as well as picturesque views from their balcony, which includes the mountains, the Neon Museum and the bustling activity of popular downtown events such as Life is Beautiful. They love the community’s staff and concierge team, which offers peace of mind when important packages arrive for them. “Living at The Ogden is such a nice departure from the upkeep of a single-family home. The rooftop pool and Sky Deck are perfect for hosting friends. And we love the fitness center on the 15th floor, which is equipped with everything we need to maintain our figures! And as a professional acrobat, maintaining my physique is critical to my livelihood,” Furmanczyk said. Since acquiring The Ogden in 2013, DK Las Vegas has made a $2 million investment to remodel the lobby with high-end design treatments to create an immediate sense of luxury and arrival; added new upgrades throughout all residences, including new lighting, hardwood floors, granite countertops and stainless steel appliances; and enhanced amenities such as a Sky Deck, social lounge, fitness center and refreshed rooftop pool. Right outside the front door of The Ogden are more than 150 restaurants, many of them among the city’s most popular eateries, bars, attractions and an energy that continues to build with ongoing redevelopment of downtown Las Vegas. The Ogden offers flexible financing options, including Veterans Affairs- and Fannie Mae-backed loans. Available homes range from a two-bedroom, 1,180-square-foot residence priced from the mid-$300,000s to a three-bedroom-plus-den 2,044-square-foot home starting in the low $500,000s. The Ogden’s single-story, open floor plans offer flex spaces that can serve as a home office, den or yoga room, extra bedrooms for accommodating multigenerational family and guests, and expansive windows that fill interiors with natural light.